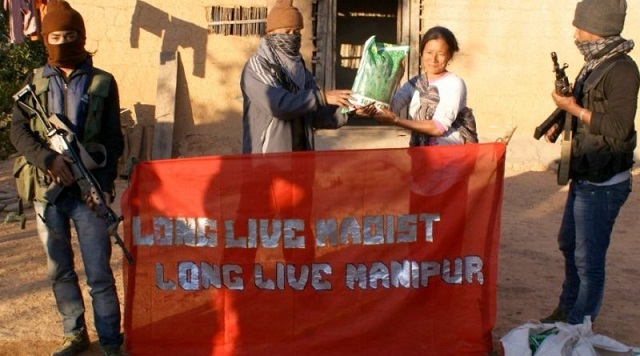 The Maoist Communist Party Manipur after their formation has been striding forward militarily and politically in both national and international level. The year 2016 was however the year where our efforts bore fruits and showed the world our mettle. reactionaries who are supposedly in Suspension of Operation with our enemy, cowering & bending down to the enemy. The motive behind our strike against these traitors is to teach them a lesson that the no individual or a group can or will be allowed to tarnish the image or the steps taken up by our Lamyanba Late Hijam Irabot. Besides the attitude shown by these thugs to the locals and especially under the influence of intoxicants was obnoxious beyond tolerance and the MCPM stood for the people of Lamlai area, destroying their hideout. And for that matter, we the MCPM stand for all the people of Manipur. The second strike by our cadres of MCPM was on the 22nd of April where another urban unit of New Peopleʹs Militia struck Lamphel Police Station. Though collateral damages were not so heavy & remarkable, what was significant in this strike was the message conveyed to our nemesis the will and the gall to strike anywhere anytime and any day. The third outrageous strike of the MCPM was at the heavily guarded place of illicit drug trade locally known as the Route-39 Restaurant. Despite the presence of heavy security personals, an urban unit of the MCPM made a mockery of the armed personals posted there (so that Okram Henry can conduct his narco trade unhindered) and successfully carried out the token strike against the low life thug merchant of death. We the MCPM will continue to strike against such enemy of the people and the next time will be the final decisive one. The fourth operation of the MCPM was the assault on the camp of the occupying enemy force located at Nongpok Sanjembam, Imphal East, where a unit of the New Peopleʹs Militia encircled the enemy camp and carried out a surgical precision strike and vanishing into the thin air even before the enemy realized what struck them. These various strikes carried out by the New Peopleʹs Militia have taught us many a lesson and we will continue learning as we teach our enemies lesson after lessons. From the political point of view, the year 2016 is also a year where we the MCPM have harvested many a good tidings. For more than two weeks in Sept 2016 there was an intense discussion and a discourse which led to a more organized structural reform within the party enabling us to perform our objectives in a more professional way. A five member standing committee was formed and various reformatory works were implemented. This endeavor was possible because of the fact that there was three more grassroots brainstorming held in the months June, September & December 2016. This is for the information of the people that since 2011, we the MCPM have been launching a political offensive through the written media and it was in 2015 that the MCPM launched its Military campaign & since then there was no looking back. The year 2017 is very promising to us the MCPM as we strive to enhance our Military capacity & capability, making the Manipur Proletarian movement a big success. We also are in our final moments of forming our Party Committee and we the MCPM sincerely express our gratitude to those citizens of our beloved Manipur who extended us their valuable help in making us reach this far. We hope and pray that our journey does not end till we reach our goal of freedom. We also express our respect and gratitude to the media fraternity for respecting the ethics of journalism & for practicing a fair journalism by publishing our annual press release in the media. And lastly the standing committee on behalf of the MCPM and its armed wing, The New Peopleʹs Militia (NPM), convey our gratitude to all the people of Manipur and wish you all a very wonderful New Year 2017. It also warned the private hospitals and schools to revise their fees structure within three days and bring down the fees to a fair and acceptable amount. The press release furthers that the fees charged by the private hospitals are unbearable to the people. Manipur is a territory controlled by the Indian state, that shares a border with Burma. It is inhabited by a population of 2.5 million people, and more than a third of it lives below the poverty line in a predominantly rural economy.